That is a reference to the final chapter in the book, which highlights a few of the ghost towns that once thrived in the county. Sometimes only a building or two remains in these places that still have a place on the map and in the memories of elderly residents. 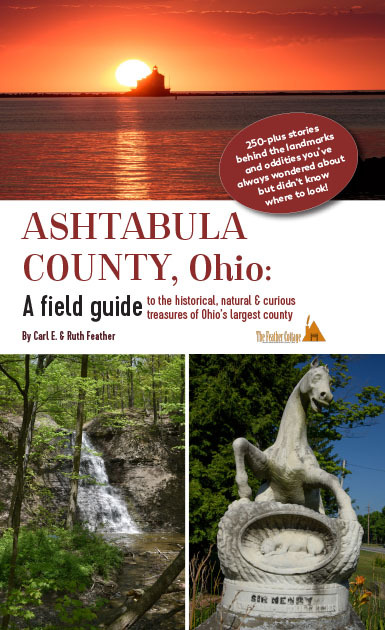 The “Field Guide” was inspired by my wife Ruth, who decided to relocate to Ashtabula County after accepting my marriage proposal. There was much for her to learn about the county, and so we set off on adventure after adventure as I introduced her newly adopted home. Along the way, a book took form. At first, I was thinking 100 or so entries, but once the lists were made and research began in earnest, the book nearly tripled in content and size. The content is categorized as natural treasures, structures, transportation, curiosities, memorials/monuments and ghost towns. Each entry includes a picture, short story and, oftentimes, trivia about the topic or site. It is a different sort of book for me; the stories are short and to the point, but I’ve tried to tuck into each story a nugget, bit of humor or little-known fact about the topic. The first-person interviews, which are used in my other works, are absent, yet the conversations with hundreds of residents and historians underpin many of the entries. The book is available on amazon.com as both a Kindle ($5.99) and softcover book ($21.95). The Kindle book is not indexed and, frankly, is not very reader friendly, but that is the nature of Kindle formats. The print edition is fully indexed and includes a list of attractions for each town/township/village. “A Field Guide” is also available in our website store. We pay the shipping on books ordered from the website, and each book is signed by Carl. If it is a gift, or you want a special inscription to yourself, let us know when you order. Carlisle’s Home in the Harbor on Bridge Street has autographed copies for sale, as will the Ashtabula Maritime Museum for its Christmas event. The book was launched at the Ashtabula County Covered Bridge Festival, where my frozen fingered managed to sign a couple of dozen books to folks who braved the rain and frigid temps to acquire a book from our table at the Graham Road Covered Bridge. Many of the folks commented on missing my work in the Star Beacon, which I departed more than five years ago. And that leads me to the dedication. After I left the newspaper industry, I had the privilege of working for the three best supervisors I had in my 40-plus years of working: Ashtabula County Commissioners Joe Moroski, Peggy Carlo and Dan Claypool. They had the vision to combine a lodging tax administration and tourism special projects coordinator into a position under the county commissioners’ office. During the nearly five years of working in that job, I was part of many interesting projects that were launched with grants and private funding and have helped introduce tourists to our county’s story. Unfortunately, a new board of commissioners saw no value in the position and abruptly eliminated it … which leads me to writing books! I wanted you to know about someone who wrote a lot of stories that take place in Ashtabula: I. C. Talbot. I’ve been slowly editing and publishing her work since 2010. A new short story just came out today — Mazie’s Diner. It’s available only as an e-book right now. She was one of the pioneers of the Bridge Street Restoration Project, and the owner of the Leeward Lounge from 1970 to 1987. Here’s her Amazon page. Hope I don’t have any spelling errors. It’s very hard to see light gray on white.